"England, 1660. Ella Appleby believes she is destined for better things than slaving as a housemaid and dodging the blows of her drunken father. When her employer dies suddenly, she seizes her chance--taking his valuables and fleeing the countryside with her sister for the golden prospects of London. But London may not be the promised land she expects. Work is hard to find, until Ella takes up with a dashing and dubious gentleman with ties to the London underworld. Meanwhile, her old employer's twin brother is in hot pursuit of the sisters. It's always a little awkward reviewing a book which you don't completely trust your feelings about. A part of me loved The Gilded Lily. Another part of me hated it. The parts I loved were Sadie and Dennis, two very kind, and misunderstood kids fighting to survive. These two are literally the only two likable characters that you will root for, maybe excepting one girl that Sadie works with, the only girl who shows her kindness. I loved the time period. England in the mid-1600s was a pretty odd place. The government and its people were unstable from civil war and an odd mix of the filthy rich and dirt poor - we see both extremes in this book. It was interesting reading about the harsh working conditions/options for girls in this time period. I did NOT like Ella. Or Jay (the "dashing and dubious gentleman" described above). Or any of Jay's friends. Or his father. Or Ella and Sadie's boss. Everyone was sinister, a murderer, two-faced, or just a plain jerk. I've never really read a book that contained so many characters I disliked. I also spent a majority of the time just waiting on something, ANYTHING, to happen. What you read in the summary is basically what more than three-quarters of the book was actually about. I don't like reading 200 pages of a book and still questioning what the actual plot is. FINALLY, we get some action and a climax at the end of the book....but it's really dark and a little terrifying. I came away from The Gilded Lily feeling really depressed. You can practically feel the dreariness of London upon you as you read. Ella's horribleness rubs you the wrong way. The rank living conditions make you feel unclean. Reading about Ella and Sadie's close encounters with the law puts you on edge.The smarminess of Jay and his creepy friends makes you uncomfortable. I must say the the ability to produce this many real emotions shows a great writing ability, and I really did like the writing style and 17th century dialect, but leaving a book feeling used and violated isn't ideal. Never fear! 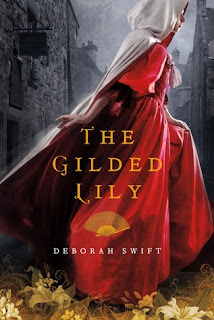 You have the chance to form your own opinion about The Gilded Lily! I have a review copy for one of you. The giveaway is international and open until the 30th. Enter HERE, good luck!